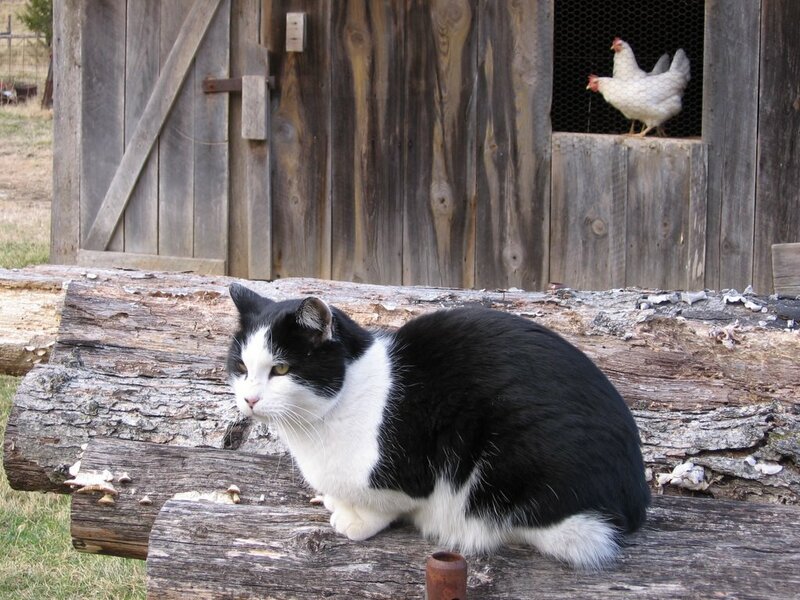 Yes, those are Joe's (now infamous) 'thrifty' egg layers keeping an eye on Patchy Cat. And yes, they laid two more eggs yesterday. Two. That makes five in less than a week (after months of nothing--which is what my two chickens are still laying). Oh, the humiliation. Oh, the fabulous Christmas breakfast Joe has planned for himself and those eggs. But that's okay. I'm having scones (made with eggs I had to buy). Attention Cat Lovers! This Is Weekend Cat Blogging #29! Visit my pal Clare & her beloved cat Kiri at Eat Stuff in Australia for all the links to this week's kitties--and to see why this is Clare's very best Christmas ever. Merry Christmas to Susan, your family and all the animals on the farm! I am so happy for Clare. I kept checking back, just hoping! Thanks again for the inspiration for the lentil soup recipe. For Christmas I gave all my siblings (nine of them!) lentils and smoked paprika in their packages. Hey hey... Pree kitty! Looks like my bandit kitty. I gotta get my WCB done too! Tasteless, Jeff. Kind of like those el-cheapo "thrifty" eggs. Those chickens of yours are outta control. A merry christmas to you, and yours-2 legged, 4 legged and, of course, winged.